North Korea's Food Crisis Was Devastating In The 1990s. How Is The Country Faring Now? : Goats and Soda Agricultural scientists and aid representatives believe the country is still unable to feed all its population. Why is that the case? 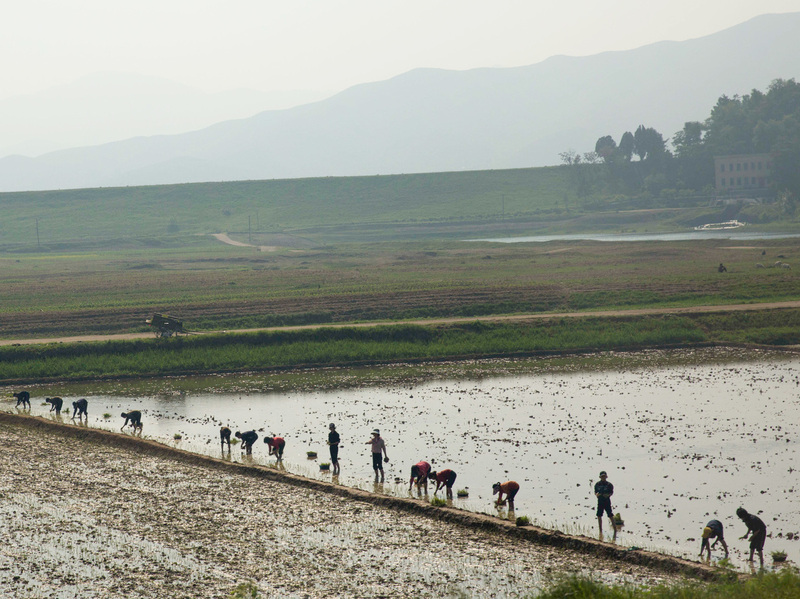 North Korean farmers work in a rice paddy outside the capital Pyongyang. In the 1990s, a devastating famine struck North Korea. According to international observers, a combination of drought, flooding and government mismanagement decimated food production. The death toll is uncertain, but estimates range from 240,000 to 2 million. By all accounts, the situation is better today. Domestic agriculture has improved significantly. Today, grain production hovers around 5 million tons per year, roughly double what it was in the famine-stricken '90s. But agricultural scientists and aid representatives familiar with the situation believe that the country is still unable to feed all of its population. And some question whether it even wants to. The reality in North Korea remains bleak. As Kim Jong Un sat down to dine on beef short ribs and avocado salad with Donald Trump in Singapore last week, the issue of hunger is still pressing in his nation. Indeed, Trump himself tweeted on January 2 that Kim Jong Un has a "depleted and food starved regime." According to a 2017 report by the Food and Agricultural Organization of the United Nations (FAO), two out of every five North Koreans are undernourished, meaning their calorie consumption doesn't meet healthy thresholds — for example, 1,080 calories per day for children under 5, and 2,900 calories per day for women who are pregnant or nursing. Furthermore, 28 percent of North Korean children are stunted — abnormally short for their age, a condition that the World Health Organization calls the "largely irreversible outcome of inadequate nutrition and repeated bouts of infection during the first 1,000 days of a child's life." The roots of what is known as "food insecurity" lie partly in the geography and climate of the country. Mountains cover most of the nation, leaving few places to farm. North Korea is also beset by widespread erosion and frequent drought. In addition, many of the country's farmers do not have access to modern agricultural machinery like tractors and combines. Add it all up, and you're left with a country that is reliant on neighbors for much of its food. "Agriculture is still insufficient to feed the population," explains C. Jerry Nelson, professor emeritus of plant sciences at the University of Missouri in Columbia. Nelson has made several humanitarian visits with the American Friends Service Committee (AFSC) to North Korea to give seminars and provide agricultural advice to North Korean farmers. Around 30 percent of the country's food comes from external sources, Nelson estimates. Foreign aid provides a good portion of that 30 percent, but funding for aid programs has been getting scarce. A report released this month by the U.N.'s World Food Programme (WFP), which relies on donations from the governments of member nations, reveals it only has $15 million to address the $50 million yearly need in North Korea. It's difficult to know exactly why donations have dropped off. But Linda Lewis, country director for the Democratic People's Republic of Korea at the AFSC, says the current environment of economic sanctions plays a role. Since the mid-2000s, the U.N. has imposed dozens of sanctions restricting the flow of money and goods in and out of North Korea in an attempt to pressure the country into giving up its nuclear program. The noose has grown tighter over the past year — in September 2017, President Trump signed Executive Order 13810, which allows the U.S. government to seize the assets of any individual or company trading goods and services with North Korea. Current sanctions allow exemptions for humanitarian food aid, but Lewis says the process of getting a humanitarian exemption is cumbersome and intimidating. Lewis notes that at least one major donor has placed restrictions on its donations to AFSC's humanitarian mission to North Korea in response to sanctions, though she declined to identify the donor or the nature of the restrictions. "It's really hard to be sure you're in compliance, particularly with the U.S. Treasury regulations," Lewis explains. "Donors are put off, vendors are put off by these restrictions. It's just easier not to get involved." David Orr, communications officer for the U.N.'s World Food Programme (WFP), agrees that donors are leery. In an emailed statement to NPR, Orr wrote that "the legal and political consequences of the sanctions have resulted in UN member states, private companies and individuals exercising greater caution, or reluctance, when engaging with WFP and the UN system in general." Regardless of the cause, it is clear that funding shortfalls have resulted in significant program cuts. Up to 195,000 kindergarten-aged schoolchildren will lose food aid this year after WFP suspended a program offering "supplemental nutrition" in November 2017 due to lack of funding. Still, some experts question the effect sanctions are having on food availability. "My impression is that the humanitarian loophole is doing what it is intended to do," says Nicholas Eberstadt, referring to exemptions written into the sanctions that allow the importation of food aid. Eberstadt, a political economist at the American Enterprise Institute, acknowledges that there have been some "unfortunate, inadvertent effects" of the sanctions on aid organizations. Still, he doesn't believe sanctions are having a major impact on food security. According to Eberstadt, the problem of food security goes much deeper than sanctions: North Koreans go hungry because their government wants them to, he asserts. North Korea weaponizes hunger as a way to control its population, says Eberstadt. Even if the Kim regime had the resources to fully feed its population, Eberstadt doesn't think it would. "It's impossible to talk about food security in North Korea without talking about their odious songbun system, the social control mechanism by which they stratify the nation into different social classes," Eberstadt argues. Songbun refers to a longstanding system of state-sponsored discrimination. Large numbers of people in North Korea — mostly urban citizens who can't grow their own food — consistently rely on government-issued rations. How much you get is determined by your family's perceived loyalty to the state. If your grandfather fought the Japanese in the 1940s or worked in a factory, your rations are likely to be relatively generous. But if your grandfather was a lawyer or a merchant, your rations are comparatively meager. Given this system, "it's hardly surprising that there should be rampant malnutrition in North Korea," Eberstadt says. It's still unclear what the recent summit between President Trump and Kim Jong Un means for food security in North Korea. If relations thaw, Lewis is hopeful that access to agricultural technology will improve and North Koreans will become more self-sufficient. Eberstadt is less optimistic, believing that significant improvements in food security can only come once the state-sponsored system of discrimination is dismantled.